Tear downs in Arlington Heights continue at a rapid pace this summer. The wrecking ball will soon be destroying a house on West Park Street on a double lot that is currently for sale. This simple ranch has an amazing back story and was surrounded by controversy. 315 W. Park is not a Sears house, but was a six-room factory-built house erected on July 14, 1950. That's right... it was put up in one day. The house was purchased from Mobilhome Corporation of America. Mobilhome Corporation of America was started in 1946. Mobilhomes were built intact at the factory and shipped via three-wheeled trailer to their destination. The selling prices included full basement, decorating, permits, utility hookups, sidewalks, and rough grading. The cost would be about 10% less than erecting a conventionally built house on-site. Headquartered in Bakersfield, California, Mobilhome had a franchise in Franklin Park (awarded to the Chicago Steel Structures company). Selling and fabrication were done locally. The Franklin Park franchise hired only union carpenters. Subcontractors (also union labor) were hired to handle the plumbing, electrical and heating unit installations. The factory in which the house at 315 W. Park was built. Because the factory was completely inside, houses could be built all year long--even in Chicago. The floor joist and the flooring would be assembled first. The base would then move on rollers to stations where the walls would go up, the roof was nailed on, and a finished house emerged at the other end. 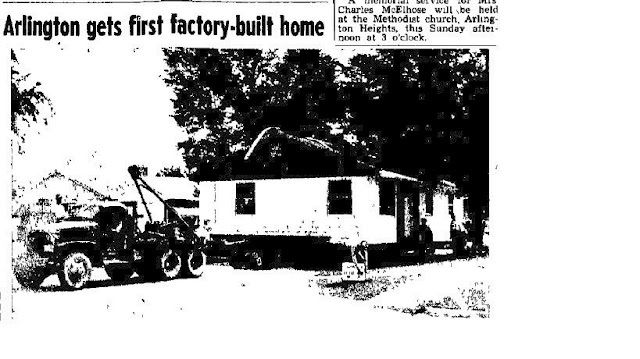 Because the house moved on an assembly line during construction, the founder called them "Mobilhomes". It took the Franklin Park facility about 60 days to complete a house. Houses come off the assembly line in California. Cool! There were seven Mobilhome models. Each house weighed about 10 tons and could be a maximum of 26 feet wide to fit down most streets. In their advertising, the company stressed that their houses were not prefabricated. "They are built the very same way a home would be built on your lot, only faster, better, and more economically. When completed, your home is moved intact to your lot, where workmen have laid a waterproof concrete basement. There it is anchored, and all utility connections made." Moving the house and setting it up required one day. The house was jacked up and lowered onto the foundation. Floor joists were attached to the foundation. Sewer, gas, electrical, and water hookups were made. The bottom row of siding was put on. Pre-assembled trim was nailed to the four corners of the house, and a painter came in to do touch-ups. Voilà! Instant house! The buyers of the house at 315 W. Park were Mr. and Mrs. Edwin R. Tierney, formerly of Chicago. The house was sold for $12,000. On that July day in 1950, the complete house was moved into Arlington Heights on a trailer at 11am and within an hour was on the foundation. Here it comes! The neighborhood kids must have been out of their minds. As you might imagine, some neighbors were not pleased about the Mobilhomes arriving to the village. In early 1951, H.B. Hutten wrote a letter to the Daily Herald objecting to the construction of a Mobilhome on the corner of Orchard and Evergreen. "...we have a definite grievance if a so-called 'house' of this trailer-delivered mobile type is permitted to be erected in our midst." Neighbors were attending the public hearings before the village board to express their opinion that Mobilhomes did not confirm with the existing architecture and that real estate values would be reduced in the neighborhoods where these houses were constructed. "Let me assure you that the citizens of Arlington Heights are becoming more and more alarmed about the increasing necessity for them to be constantly on the alert to protect their interests and the interests of the entire village so far as its future appearance and general prestige is concerned," Hutten wrote. Hutten and his supporters wanted the board to deny all future permit requests for Mobilhomes and threatened to engage legal counsel in order to delay the issuance of the permit for the proposed house on Orchard and Evergreen. Were the Mobilhomes, in fact, inferior construction? The city of Chicago banned Mobilhomes outright simply because the walls were made of drywall (plastered walls would not survive the moving process). Ironically, the Mobilhomes were better built than conventionally-built stick houses because they had to survive the move. For instance, floor joists were 2x12 rather than the standard 2x8's, and braces of strap steel crisscross within floors and walls. There were also supporters of the Mobilhomes in Arlington Heights. In the Daily Herald, Mr. and Mrs. M.M. Born wrote that the house on Park "is by no means a detriment to that neighborhood, nor would it be to any other. It is not, of course, a $35,000 home, but it is, we understand, worth between $14,000 and $15,000. Is this 'low-cost housing'?" I would imagine the village trustees were most influenced by the letter from Edward Tierney, the owner of the Mobilhome on West Park. "We are proud of our home and feel that the people of Arlington Heights should be told more of the details about its size and type of construction so that they may not be unduly influenced in the future by letters of the kind written by Mr. Hutten. "From the tone of Mr. Hutten's letter, a reader not familiar with the Mobilhome might assume it to be a cheap shoddy affair thrown together in some out-of-the-way place and hauled to the site on a two-wheeled trailer. It is far from that. "Our home is 24 feet wide by 44 feet in length and has six rooms with a full seven foot basement. It is fully insulated and has hardwood floors throughout. We have a tiled bathroom and a cabinet kitchen which is big enough for our family of five to eat in comfortably if we wish. We have an automatic heating system and hot water heater. There is a large wardrobe closet in each of the three bedrooms, a big linen closet, and also a guest closet. The home is soundly constructed of top-grade materials. It is moved to the site on a trailer of the type used by any modern house-moving contractor today." Tierney's letter is a fitting epitaph to the 63-year-old house. The house was demolished in February 2017. Despite the protests, several Mobilhomes were sold in Arlington Heights. 916 S. Evergreen, built 1950. 207 N. Pine, building permit issued in October 1950. Mobilhomes were also sold in Addison, Des Plaines, Franklin Park, Lombard, Deerfield, Glenview, Morton Grove, Elmhurst, Glen Ellyn, Wheaton, and Downers Grove. 1765 Van Buren, Des Plaines, built 1950 for Russell and Ruth Reed. This was the second Mobilhome to come off the assembly line in Franklin Park. The cost was $10,700 for the three-bedroom house. Mobilhomes were built until 1952. The company sold over 2000 Mobilhomes nationwide. They found that transporting houses via roadways was just too difficult. The company stayed in business under the name of Customcraft Construction Co. in the 1950's and 1960's doing more traditional house construction in southern California.